This is a 5.5" HDMI OLED-Display with Capacitive Touchscreen. It has 1920×1080 HDMI high-definition output and comes with a capacitive touch panel on its screen. The touch panel supports multi-touch which can simultaneously identify 5 touch points at most. Besides, the USB touchscreen adopts DFRobot driver-free technology. So without the special requirement of installing drivers, the touchscreen can be used as easy as a keyboard or a mouse. It can be directly plugged into a computer for touching control, which is able to replace the mouse. In combination with an HDMI display screen, the display device turns into a tablet PC in seconds! The screen supports three mainstream operating system: Windows, Linux, and MACOS. It can work with Lattepanda, Raspberry Pi and other devices with HDMI output, which can truly be totally compatible with all platforms. The design of the special hole on the back of the screen is convenient for the direct installation of the product in Raspberry PI's controller. There is no need to provide an external power supply for the screen as it can be powered by USB port. In addition, the display brigtness is set by host systems, no need for hardware adjustment and convenient to use. NOTE: Please guarantee the external power supply current is above 1.5A@5V when it is driven by raspberry Pi. The lower current will darken the screen and reduce the touching sensitivity. The screen supports Windows, Linux and MACOS. You can configure the output resolution through setup on Windows and MAC, and through command on Linux. The adapter included in the package is only suitable for Raspberry Pi. For other systems, you need to buy yourself the corresponding adapter. 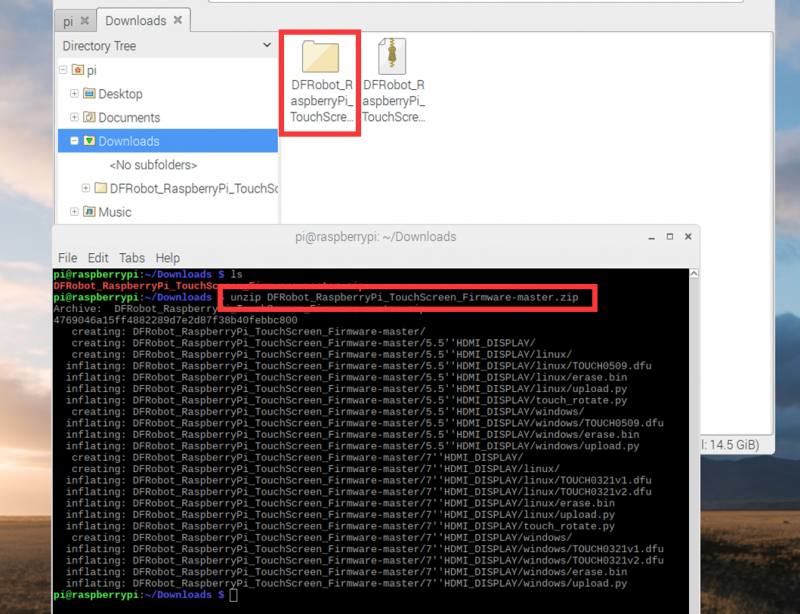 Enter the folder DFRobot_RaspberryPi_TouchScreen_Firmware-master/5.5 HDMI_DISPLAY, then input sudo python touch_rotate.py and the value of display-rotate in config.txt. Now you just need to wait for the restart of the Raspberry Pi. The firmware update method of 5.5” FHD touchscreen is same as 7” touchscreen. 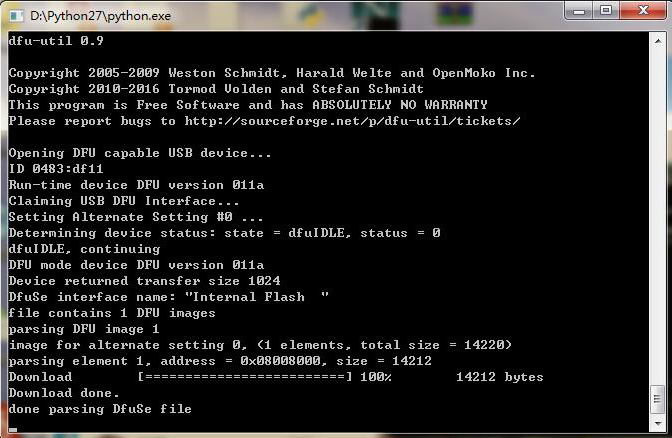 Dfu-util (Device Firmware Upgrade Utilities) is a free, open-source, and cross-platform firmware update program. 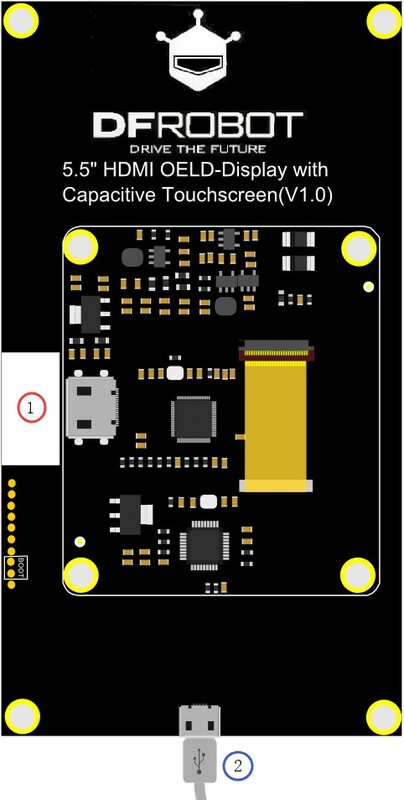 Without platform limitations, it is easy to update firmware for devices with microcontrollers. Please visit the official web at http://dfu-util.sourceforge.net for more details. 2. Enter dfu mode Short-circuit the boot’s two pins, and then connect it to the computer via USB (Short-circuit first and connect). Click continue to install if a dialog box pops-up. 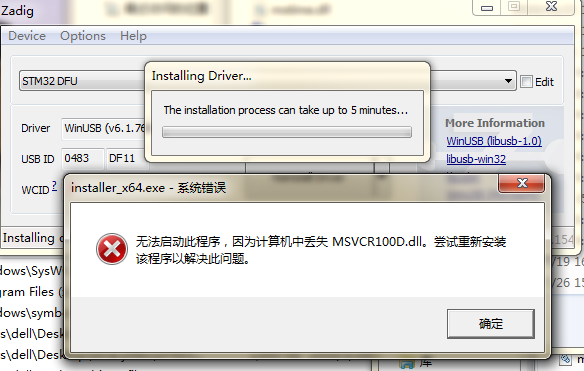 Win7(32 bit/64 bit) Download msvcr100d.dll, place it in the C:\Windows\System32 directory, and re-install the driver, then it won't report errors. 32 bit Download msvcr100d.dll, place it in the C:\Windows\System32 directory, and re-install the driver, then it won't report errors. 5. 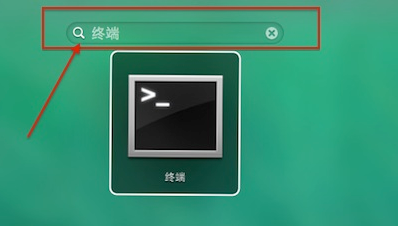 Unzip the file to you computer, such as “desktop>dfu-util-0.9-win64”, and it can be used without installation. 6. Click to download files for a firmware update, then unzip the file and copy the xxxx.dfu, erase.bin, upload.py in the /5.5"HMDI_DISPLY/windows directory to the directory ”desktop>dfu-util-0.9-win64”. 8. The following interface indicates that the program is being burned. When the progress bar goes to 100%, the program burning is done. 9. After the burning is finished, re-plug USB device. 1. Enter dfu mode Short-circuit the boot’s two pins, and then connect it to the computer via USB (Short-circuit first and connect). 4. Click to download files for firmware update. Search for “terminal” on the top of the screen. 4. Use upload.py for firmware upgrade (root privileges are required. 5. Click to download files for a firmware update. 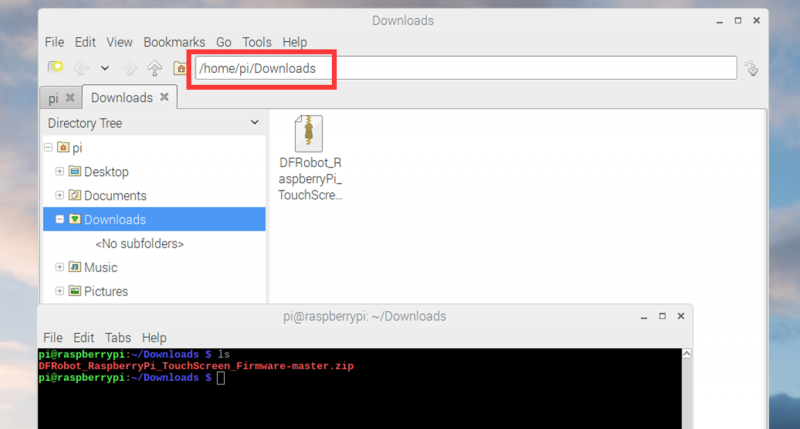 Open the terminal to enter the newly downloaded directory DFRobot_RaspberryPi_TouchScreen_Firmware/5.5"HMDI_DISPLY/linux Use the command: sudo python upload.py to run the program. 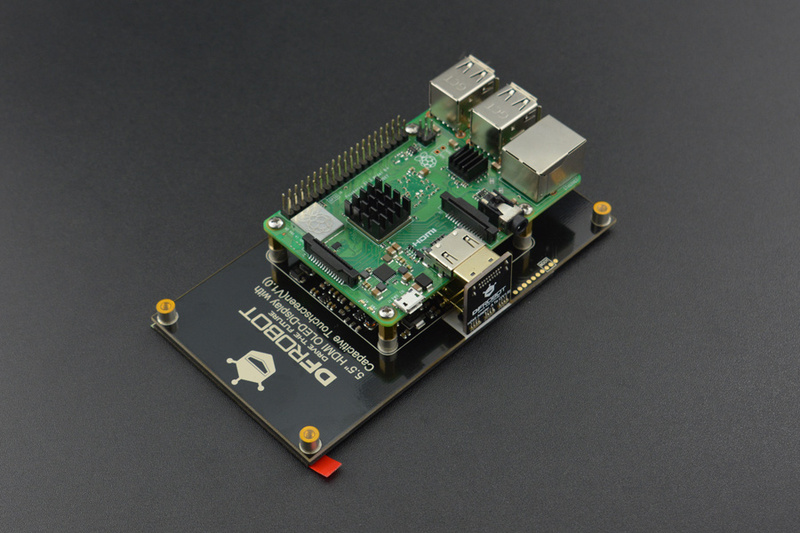 Q: After I connected Raspberry Pi, the sensitivity of the touchscreen became very poor and the response became lower. How to solve it? 1. 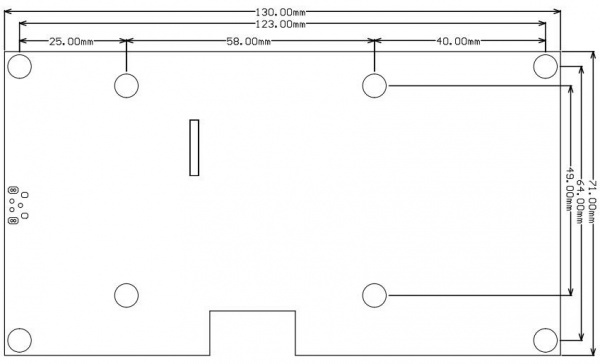 Please check the power supply of Raspberry Pi. When using the touchscreen, the minimum power supply should be 1.5A. 2. Check the resolution configuration. You can refer to the Raspberry Pi tutorial. Get 5.5" 1920x1080 mini-HDMI OLED Display with Capacitive Touchscreen from DFRobot Store or DFRobot Distributor.